As the next step in the Microsoft/MIT I-Campus Alliance, the Microsoft/MIT Joint Steering Committee will be asking for proposals from faculty and students in early December, said Project I-Campus Codirector Harold Abelson PhD ’73, professor of Electrical Engineering and Computer Science. Abelson said that the steering committee will be open to a wide range of suggestions in evaluating proposals. Right now, they are “trying to think about what kind of criteria we’ll be using to evaluate proposals,” he said. Thus far, they have two broad categories of criteria. “One is ‘what’s the reward’ ... the significance of the educational impact [of a proposal],” Abelson said. The other is an analysis of how likely a proposal is to succeed. Proposals will be evaluated based on how well they align with the terms of the MIT, Microsoft agreement. In October, MIT announced its partnership with Microsoft, in which Microsoft pledged to give MIT $25 million over the next five years. MIT-Microsoft research goals include creating technologies and content to improve student learning, according to Abelson. Other initiatives are improving university administration through technology and finding new technology-based ways for universities to interact with industry and other universities. Some Microsoft funding has already gone toward launching projects such as enhancing the MIT-Shakespeare Electronic Archive and creating long-distance learning technologies with universities in Singapore. MIT and Microsoft hope for large amounts of student involvement. While research proposals are not expected to come from individuals, they could come from any group on campus, including any student group, Abelson said. “December is a hard time for students to find time to write proposals,” Abelson said. The proposals will be due in late January to give students plenty of time. Additionally the group is toying with the idea of running an Independent Activities Period activity for students interested in making a suggestion to the committee. Right now planning workshops being held. One was held Oct. 22 and another is planned for Nov. 5, Abelson said. The Oct. 22 workshop included a lot of pre-planning, according to student workshop representative Lucy Borodavkina G. The workshop group also discussed what proposals should look like. Projects “should have impact; they should be sustainable beyond the Microsoft alliance. 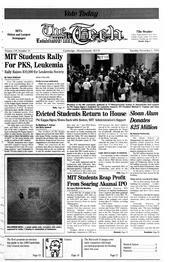 They should set a goal for MIT community as a leader in education, set an example, for the rest of the country,” Borodavkina said. Right now the workshops’ goal is to “get a sense for what the real opportunities are” and what general things people agree on, Abelson said. “For example, there’s a lot of support now for trying formats that get away from large lectures,” he said. Another much discussed topic is interactive learning. “These are not new things to suggest ... but it’s good for people to say it to each other” and turn over ideas, he said. The group could fund any sort of activity, from new technologies to facilitated learning to new class formats. “The bottom line is that we can only fund what people propose to do,” Abelson said. Abelson expects there to be two types of proposals: those with a clear plan ready to go and “planning grants” which are more sketched out. This would be a bigger idea, about which the planners need more input and more time to think about, he said. “We’ll be funding both types of proposals,” he said.